I’ve been helping out my grandparents today which was super stressful at times, I’ve also only consumed Mexican food today so I’m very happy. Today I have another food review for you today, I spotted these in my local health food store and hadn’t seen them before so I picked them up. They are the spacebars made by Wheaty. Out of the four varieties the store had two, the red hot chili peppers and the hemp. The bars have a texture which is quite similar to the Granovita pepperoni sticks except they are softer, a good percentage of their ingredients are organic and they are smoked naturally with beech. Both the bars provide a good amount of protein as well. The chili one is spicy and smokey with a ever so slightly bitter aftertaste which I didn’t actually mind because it was delicious. The hemp variety was still smokey but had much less flavour to it, despite this I still enjoyed eating it. I would probably buy both again. Wheaty, the company which makes these bars also makes a lot of other products which I would be interested in trying. You can find their website here. I’d really like to try the steaks, medallions, roast beef, roulade, and a couple of their sausages. 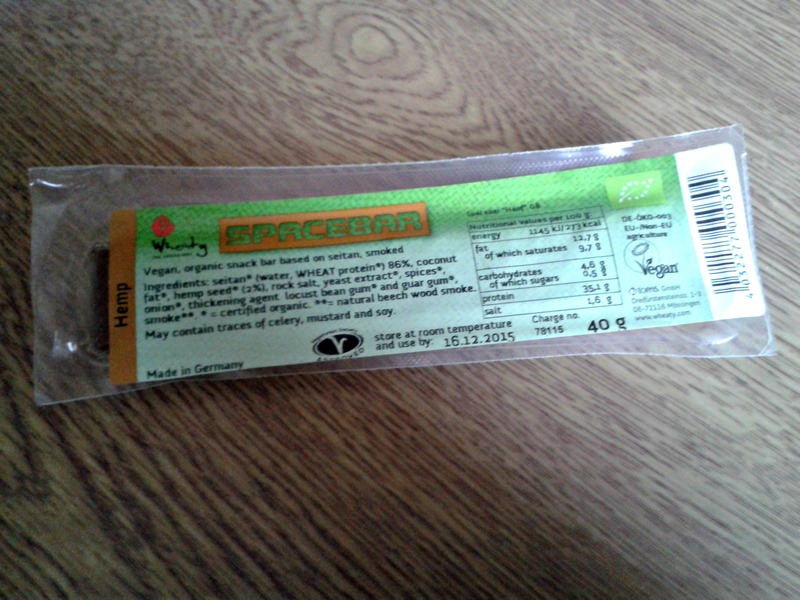 I picked up the 40g bars for £1.02 which is a good price in my opinion for a tasty little snack that you can carry around with you for when hunger strikes. Ingredients (red hot chili peppers): Seitan (water, wheat protein) 86%, coconut fat, spices, rock salt, yeast extract, onion, thickening agent- locust bean gum and guar gum, paprika extract, and smoke. Ingredients (hemp): Seitan (water, wheat protein) 86%, coconut fat, hemp seed (2%), rock salt, yeast extract, spices, onion, thickening agent- locust bean gum and guar gum, and smoke.